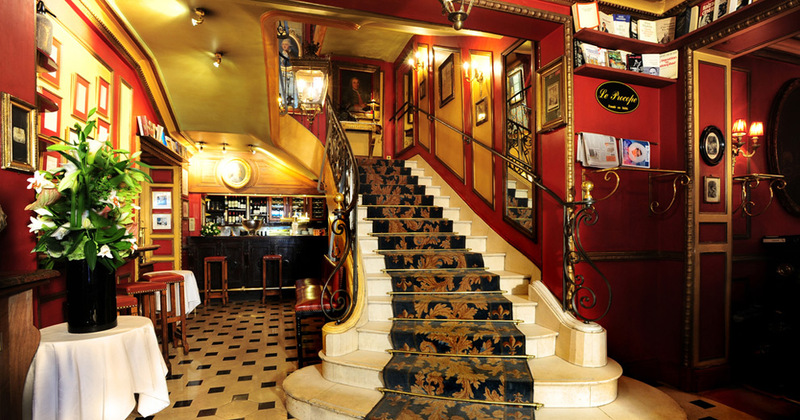 Café Procope is the oldest and among the most famous Parisian restaurant/cafés. It was the original European ‘Literary Café’ prototype. Located in the 6th arrondissement on Paris’ Left Bank, and steps from Boulevard Saint-Germain, it retains its former glory and original charm. This café’s rich backstory represents an enormous part of the socio-cultural history of café culture in Paris. Inaugurated in 1686 by Italian Francesco Procopio dei Coltelli, it did not take long for it to develop something of a reputation for being the meeting spot for intellectuals and coteries of distinguished people. In a time where who frequented an establishment was a determining factor in success, an esteemed clientele was the mark of a good café. Undoubtedly, this had something to do with Café Procope’s lauded reputation. With a relatively close proximity to the Comédie-Française, it was the obvious stop-off point for the artists and intellectuals that this area would attract. If you were to step foot inside the building around 300 years ago, you would be surrounded by well-to-do men engrossed in liberal and profound discussion, sipping an at-the-time revolutionary liquid: coffee. While quite different from today, this centuries old scene still resembles contemporary Parisian cafés, and is a practice intrinsically linked to Parisian café culture. In fact, it is largely thanks to Café Procope that coffee ever became popular, as it was the first authentic adaptation of the ‘oriental coffee house’ and one of the few establishments that had success in selling it. For years, coffee had only been sold on the street. However, the moment that influential people began to enjoy coffee here, it soon (unsurprisingly) became the drink of choice for many. In a short time, the image that surrounded it became more important than the drink itself. Since then, café culture has become a focal point for literature, art and film. It all began at Café Procope. Café Procope did not have a shortage of influential customers. 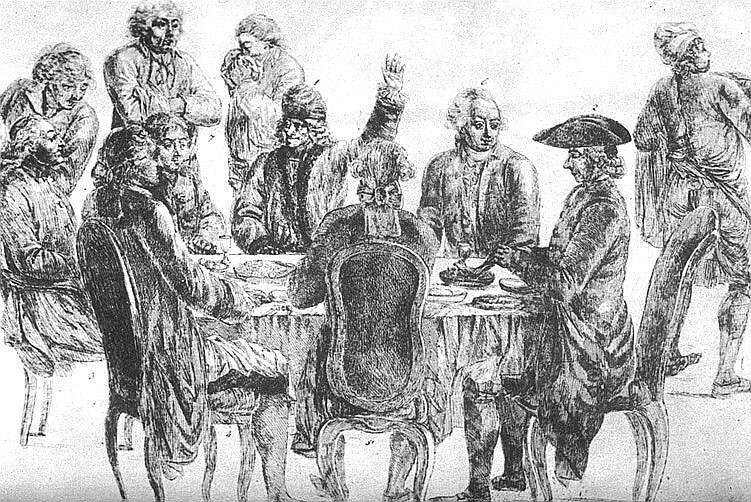 Rousseau, Denis Diderot and Voltaire are just a few of the great figures who frequented the café and heightened its image, making it a cultural and political hotspot. Some of the most progressive philosophies of the time, which would go on to change the French nation forever, were potentially mulled over at this café. It became the space where the most advanced ideals of the Enlightenment would become asserted and the intellectual upheaval of the time would be stirred up. In time, it would also attract the likes of Americans Benjam Franklin and Thomas Jefferson, who spent time in Paris and contributed to these discussions. Rumours have since circulated that Voltaire used to drink up to a hundred espressos a day here, mixed with chocolate to take off the edge. His desk is preserved for public viewing on the second level of the restaurant. The ‘chocolat chaud’, for which he can be viewed as a trend-setter, is a house speciality. Of course many of the ideals that emerged from the Enlightenment – such as tolerance, fraternity, the wish for a constitutional government and anger towards the abuses of the church and the state – would go on to inspire the French Revolution and are now prominent in French society today. 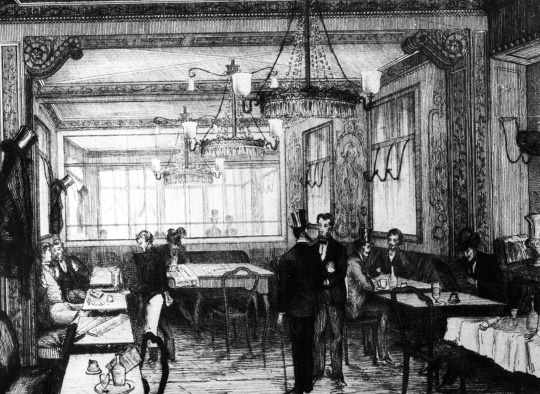 During the time of the Revolution, Napoléon himself would become a patron of the café, joining many others who would continue to congregate here. It was used as a space from which to deliberate the most pertinent on-going issues over a game of chess and a petit noir. It is said that he once left his hat as payment for his coffee. If only we could use this technique today. In post revolution Paris, Café Procope lost something of its status as a ‘literary café.’ However, this did not last for long. 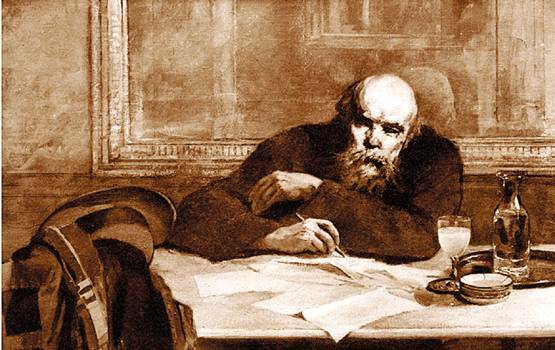 The famous poet Paul Verlaine named it his stomping ground and it soon experienced a revival in popularity. The building underwent a substantial refurbishment in 1988. Its new design sought to recapture the 18th century style. Today, evidence of its enormous history is preserved in its décor. The crimson walls are adorned with portraits in ornate gold frames, which tell a story of Paris’ history. From the ceilings hang elaborate crystal chandeliers, illuminating the mahogany furniture. Plaques commemorating the famous greats, who once drank, dined, discussed and created here, feature prominently. Each room is named after one of these significant figures, including Chopin and Franklin. The unfathomable grandeur of the interior is consistent throughout the two floors and the music that can be heard playing softly in the background further adds to the romantic, Parisian ambience. With increasing gentrification in the neighborhood, the café has become an ever greater attraction for tourists. The menu is faithful to French tradition, featuring favorites such as coq au vin, escargots, tartare du boeuf and crème brûlée. The food may not be revolutionary, but the overall ambiance and insight into Parisian history is reason enough to pay a visit. You can enjoy a coffee and be left to browse the building, picturing yourself here among the great names, during the periods where the most monumental ideas and changes were underway in France. Despite the constant emergence of new and modern ways of dining, here in Paris there will always still be a place for Café Procope and cafés like it.